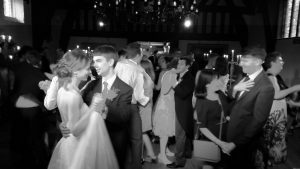 We just wanted to say a big thank you to you for DJ’ing our wedding on 4th June at Samlesbury Hall. We had a fantastic time and you helped to create a great atmosphere, which we loved and I know our guests enjoyed too. Always a pleasure to play for wedding parties at Samlesbury Hall! Congratulations to Mr & Mrs Flesher! We bring a top quality sound system as appropriate for Samlesbury Hall, modern lighting & star booth so the set up looks really nice too! Our DJ’s act as host through the evening & will tailor the music to your requirements. You’re welcome to have as much input into the music selection as you like. Alternatively, we’ll gauge it on the night &, of course, take requests off guests throughout. Prices start from £250 which covers a standard evening of 7.30pm till midnight. Additional time is £30 per hour which could include a later finish &/or playing through the wedding breakfast.